A simple fruit-forward dessert with a buttery shortbread crumble topping that’s easy to make any time of the year. 1) Using a food processor, add the shortbread, sugar, cinnamon, ginger, and sea salt to the machine and pulse until a crumb-like texture is reached. Alternatively, crush the shortbread with the sugar, cinnamon and ginger in a Ziploc bag with a rolling pin. 2) In a small bowl, beat the egg. Thoroughly mix the beaten egg with the crumb mixture and refrigerate uncovered. 1) Preheat oven to 350˚F. Place a sheet pan on the middle rack of the oven (to catch drips while baking). 2) Butter a 9” glass pie plate with 1 teaspoon of butter and set aside. 3) In a large mixing bowl, mix together 2 tablespoon sugar and 2 tablespoon cornstarch. blueberries and nectarines to the sugar/cornstarch bowl. Mix to coat all the fruit. 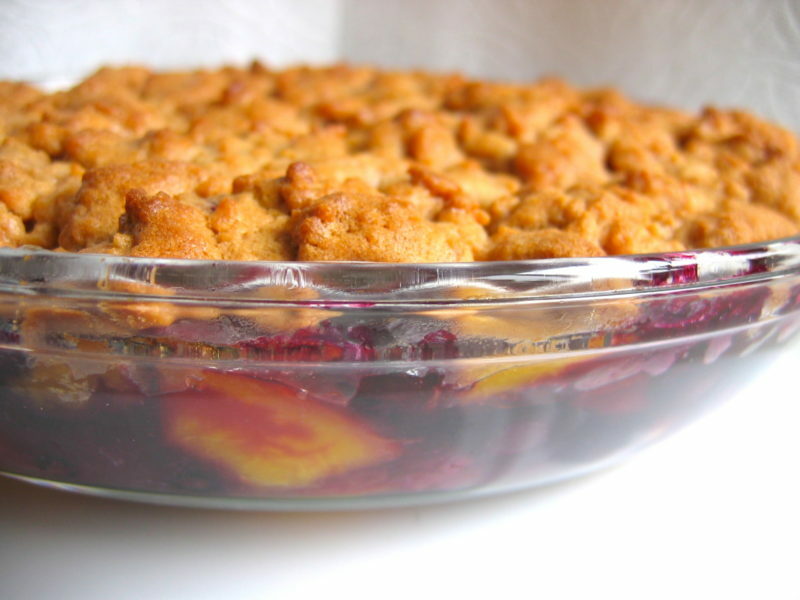 1) Spoon the fruit mixture into the buttered pie plate and spread evenly throughout. into “crumbles.” Sprinkle evenly all over the surface of the fruit. another 20 minutes. The fruit juice should be very bubbly and slightly thickened. Once it’s done baking, cool to room temperature. 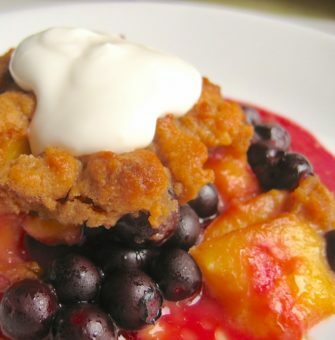 4) Serve with lightly sweetened whipped cream or yogurt, or vanilla ice cream.